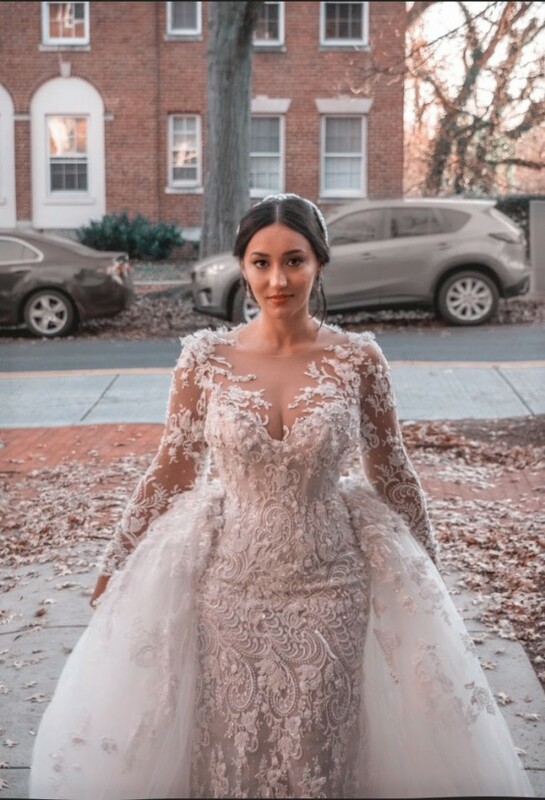 Hello everyone, this beautiful dress is one of Steven Khalil's most famous and expensive dresses. 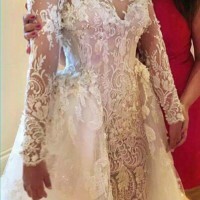 It is an ivory, french beaded lace custom made dress. It comes with a puffy, beaded and lace decorated detachable skirt and veil. I wore it only once for my wedding day. I'm not sure about the overall size but here are the detailed measurements: Bust 35 waist 27 Hip 38.5 Upper arm width 10.5 Arm Length 22.5-23 Wrist width 6 The dress is not dry cleaned but it's actually very clean, it doesn't have any stains or dirt marks or anything like that. The dress comes with the veil not the headpiece but I can sell it to you separately. It has a little hole that can be easily covered with lace. (I have extra lace from the dress fabric that I kept and can send to you with the dress). Once you send a message, Marwa can invite you to purchase the dress.